Poly Bags - Poly Plastic Bag, Pink, Anti Static, 6 mil. Home > Poly Bags and Tubes > Poly Bags - Anti Static Poly Bags > Poly Bags - Poly Plastic Bag, Pink, Anti Static, 6 mil. Helps protect sensitive electric components from electrostatic discharge (ESD). Amine free interior. Bags can be taped or heat sealed. 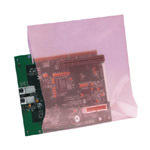 Display All Poly Bags - Poly Plastic Bag, Pink, Anti Static, 6 mil.